Blockopedia is a new book published by Egmont that details every block in Minecraft. While players will enjoy the extra information, onlookers are offered a window into how Minecraft provides a creative canvass for block based constructions. Minecraft blocks are the essential elements that not only make up the world, but that players use to make their creations. Each block has different qualities and inter-dependencies that require a detailed understanding to make the most of them. Even young players soon learn how this all works and can identify the numerous types of blocks they may need. 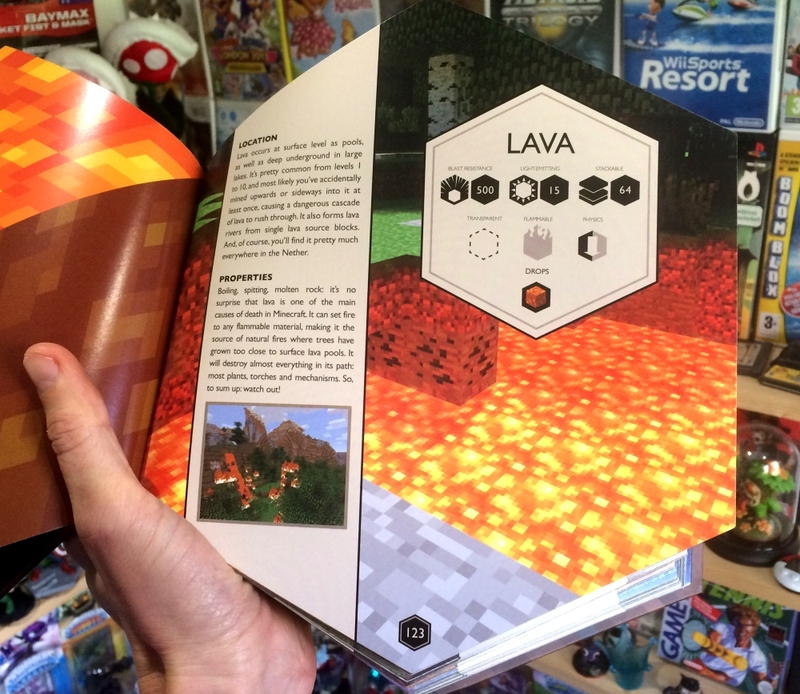 The book, itself shaped like a block, groups things into different categories: naturally generated blocks, ores and minerals, plants, liquids and gasses, player created, utility and mechanism. Each of the blocks is measured for blast resistance, light-emitting qualities, transparency, physics and flammability. These details will make more sense to those who have played the game, but even for outsiders it’s fascinating to see just how much is going on beneath the surface of Minecraft. Although the game looks simple and visually retro, this block ecosystem is as complex as any modern video-game. As with any “fan service” publication though there is an element of cashing-in on the popularity of a particular product or brand. Certainly, Minecraft represents a huge potential audience, and with the book releasing on December 4th is likely to sell out before Christmas. 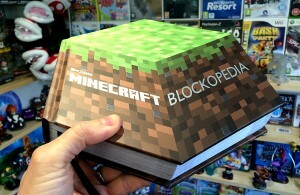 However, Blockopedia has more content than might be expected here. This, along with the top class presentation, should ensure it is both useful and interesting once the initial novelty has worn off. Another potential downside with a printed book like this is that it can go out of date quite quickly. Here though there is enough solid basic information that the book will continue to be useful even when it is no longer comprehensive. Written by Alex Wiltshire, former editor of Edge magazine, the book expands on the basic properties of each block to offer advice and suggestions around their function and use in the game. The extends to how the blocks can be used in crafting to make a variety of useful secondary building materials. Perhaps the only real omision in the book is an alphabetical index to look up blocks. Without this readers have to flick through pages or leaf through the table of contents to find particular block’s details. The book follows the other Minecraft themed publications from Egmont, Minecraft Construction handbook, Minecraft Combat handbook, Minecraft annual and the Minecraft Beginner’s handbook. These each offer more instructional information about the game and are complemented by the Blockopedia information.